Most people didn’t even enjoy being outside in the hot, muggy weather conditions last week. Imagine running 5K! 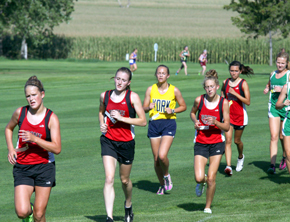 That was the task faced by cross country athletes at the season-opening Boone Central Invitational Friday at the Albion Country Club. Boone Central/Newman Grove teams wilted a bit in the sweltering conditions and finished fifth in both the girls and boys divisions of the meet, not what the Cardinals were anticipating. However, veteran Card Coach Tom Dickey feels his team will make great improvement now that they have a race in their legs.